I read the reviews about the eggs being difficult to open, I loved the message and book, so I took a chance and I’m pleasantly surprised at the quality. The message was the most important thing and I wasn’t disappointed. The eggs were difficult to open the first time, but then It wasn’t a problem. My grandchildren loved both the egg and book. My grandkids are loving this book with the stacking eggs!! I am teaching and it will be a tradition in our family to use the Story and the eggs to celebrate! Received this today and was thrilled when I opened the box. The picture does not do it judtice. 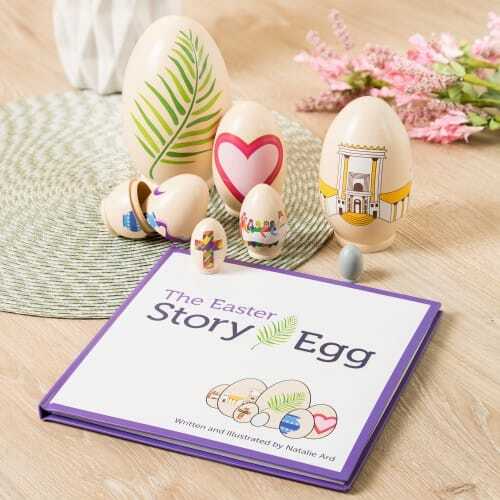 Each egg has a story making it easy for little ones to enter into Holy Week and really learn and understand the Easter story. I purchased it for my seven year old Granddaughter and will give it to her on Palm Sunday. It is well made and something we can use very Easter. I give it 10 stars. Ordered two sets. Large egg in both sets, very difficult to open. Have put that one aside and now only use smaller eggs. Read about problem when ordering but still almost impossible to open. Hello! If you follow the instructions, you should be good to go with the eggs: "These eggs are made of natural wood...so there is still some moisture in the wood. They may not be easy to open at first...when opening the eggs, don’t twist them, just pull them apart to open. Let them set out and open to dry for a few days prior to use so the wood can release any moisture. As the eggs are opened and closed after usage they will naturally loosen as well." My grandkids loved it! Goes great with the book. I bought these as a gift for my grandkids and they seem to have loved it. We bought this for our 6-year-old grandson, and it was joyful to watch him as Holy Week unfolded beautifully for him with each day's egg and reading. A wonderful way to keep youngsters focused on the importance of Easter as the celebration of our Savior's resurrection! It is VERY difficult to get the eggs apart. They are for my grandchildren and I had a hard time getting them apart:/ I may need to return them. Hi Ann! If you wish to return them, let us know! We'd be happy to help. In the meantime, here's a note on the Eggs from the folk who make them: "These eggs are made of natural wood. They are brand new so there is still some moisture in the wood. They may not be easy to open at first, so here are some helpful tips. When opening the eggs, don’t twist them, just pull them apart to open. Let them set out and open to dry for a few days prior to use so the wood can release any moisture." I purchased this item for my 3 grandson's thinking what a great way to preserve the meaning of Easter. Unfortunately, after following the enclosed directions on how to make the eggs easier to open and close, one egg will no longer fit back together. Three adults have tried, and not one can put it back together. With the eggs not fitting back together it loses the whole idea and is now useless. Family will be on the road, great way for the grandchildren to go over the Easter story. The accompanying book is delightful for the young audience. The eggs are very nicely done. Very nice product. What a beautiful Easter Story and lovely, strong, sturdy, wooden nesting Eggs. The quality of the eggs are much better than I expected and well worth the price. Our grandson will cherish these forever (and we even inscribed a short note inside of the larger egg). Heirloom quality. Thank you! A joy to share this wonderful story and beautifully handpainted, cherry scented nesting eggs with my son and his family. My grand-daughters 7, 6, and 3 all loved holding the eggs while the story was read. Thank you and God bless. My three year old granddaughter just loves taking the egg apart and putting it back together. It didn't take her long to figure out the different sizes. Very pleased. This book and its accompanying visuals was an effective and memorable way to convey the true meaning of Easter to my Parish Religious Education class of third graders. Highly recommend this! 5 stars! I purchased this to share the true story of Easter with my grandchildren. I also shared it with my Sunday school class of 3-5 year olds on Palm Sunday. The story but kept the children completely captivated. The rhyming text is beautiful. The children love opening the egg to reveal another one as you progress through Holy Week in the story. The last egg opens to reveal a grey boulder rolled in front of Christ's tomb. Even that opens to depict the empty tomb and resurrection of our Lord!